Some of the best people work in unions. Nestled about five minutes from Charlotte Douglas International Airport lies Renaissance West STEAM Academy. (“Science, Technology, Engineering, Arts, and Math”) An unlikely addition to the low-income section of Charlotte where it’s located, Renaissance West Academy seeks to reach some of the most at-risk students in the area – right in the neighborhoods they call home. For many of the K-6 students, the meals they get at school are the only meals they get all day. Every student at Renaissance West STEAM Academy qualifies for the school’s free lunch program. Plastic food bins donated by IAM Victory Lodge 1725 in Charlotte are filled throughout the week with donations for families who take them home over the weekend. Despite the many challenges they face, however, the students at Renaissance Academy are thriving. Much of this success is due to the toughness and resilience of the kids, but the whole community has joined to support the school’s goals. Faith-based networks, city agencies, and community groups all play a role, with union activists leading the way. When students at Renaissance West STEAM Academy head to class this week, they will be sporting brand new book bags, each one emblazoned with the IAM emblem and stuffed with school supplies. 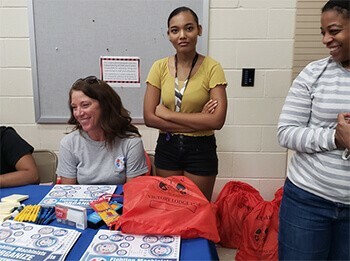 The bright red drawstring bags and supplies were gifted to the kids thanks to an ambitious donation drive spearheaded by Community Activist and Charlotte’s Victory Lodge 1725 Recording Secretary Helena Thornton. Helena teamed up with Renae Miller, the Chairwoman of the Women’s and Human Rights Committee at Victory Lodge 1725. The two of them came up with a plan to make sure that the students would start off the school year well-prepared, with the confidence and dignity that comes with having everything they need for class. But, which students would get the bags and supplies? It didn’t seem fair to set up some kids with new bags and leave others out, since every student at Renaissance West faces hardships. For Helena, the answer was clear: Everyone would get a bag. 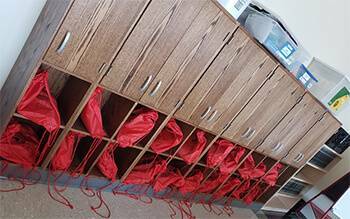 And while it didn’t seem possible for her small local lodge to buy the more than 500 book bags they would need, she upped the ante and also planned to stuff them with enough supplies to get each student outfitted for the classroom. Helena has been employed at American Airlines for 12 years, and for 9 of those years she has been a union activist. After becoming a Shop Steward, and later Women’s Committee Chair, she became Local 1725 Recording Secretary back in May 2015 and was elected to her first full term this year. She knows how to take on a project, even one as big as this one. The first calls Helena and Renae made were to District 141. After that, things began falling into place. 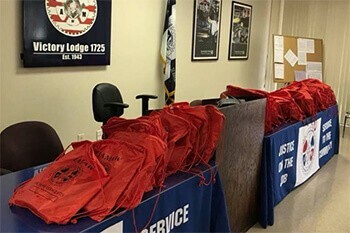 Donations from the District combined with contributions from the Obie O’Brien Local Lodge 1776 in Philadelphia, and even more donations from members covered the cost of having the bags made. Getting the school supplies, however, was proving to be tougher than expected. It was at that point that Helena got a phone call from IAM Transportation General Vice President Sito Pantoja. 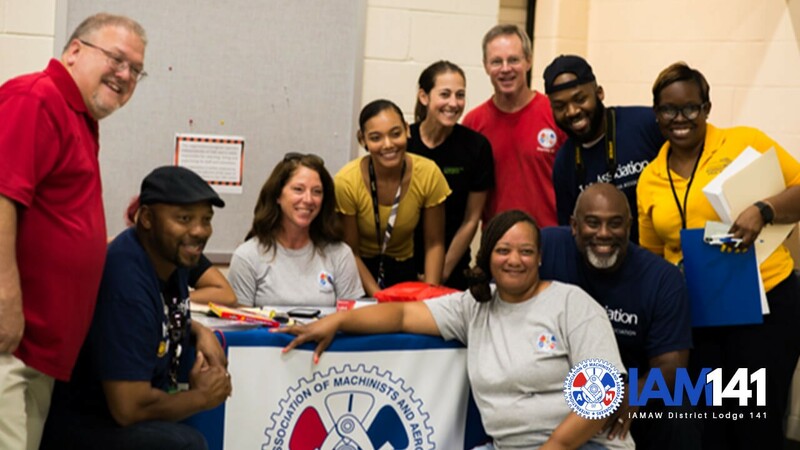 When it was all done, all 550 students at Renaissance West STEAM Academy had the supplies they needed to start the school year, all packed into a brand-new, bright red book bag proudly emblazoned with the IAM logo. Not only that, but all of the school’s 27 teachers had book bags as well, stuffed with extra supplies for the kids. It was then that the magnitude of the job became apparent. “I didn’t realize what we had done until I saw kid after kid with the red bags. I was in tears,” Helena said. If you are a member of Victory Lodge 1725 in Charlotte and would like to volunteer for the next big project, contact Helena Thornton at calhounh95@yahoo.com.